In general, when an inventory item such as a room is set as hidden from Frontoffice, it is not shown in the Frontoffice and clients are not able to directly book that item. You can, however, still add this hidden room to your packages and your clients will be able to choose it only within that package. 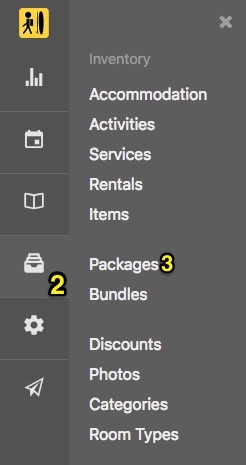 As mentioned above, sometimes you might want to make rooms, activities or other inventory items to be bookable only within packages. For example you sell a retreat which includes an accommodation, but you do not want people to be able to book that accommodation item outside the retreat package. 1. Set the inventory item itself as hidden from Frontoffice. 8. Make sure this item is visible in the Frontoffice within that package. Now the inventory item is visible in the Frontoffice only inside the package.